You are here: HomenextGet involvednextWorried about your library closing? 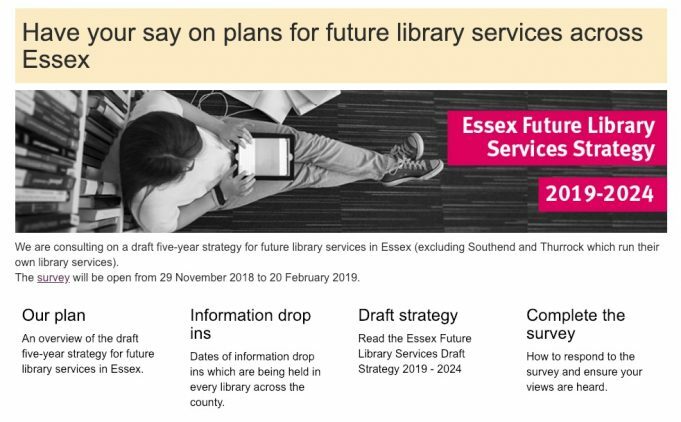 Essex Library Services has announced a planned strategy of cuts in the 74 libraries in Essex (excluding Thurrock and Southend.) 25 will close and another 19 are under threat. Here is the link to the full plan, the draft 2019 – 2024 Strategy and the Survey. If you want to have your say in keeping Hadleigh, South Benfleet or Tarpots Libraries open and functioning as part of a professional Essex Library Service – it is important that you respond to the survey before 20th February 2019. If you want to keep your library, say now. When it’s gone, it’s gone! Note that questions 7 and 8 in the survey include multiple, conflicting questions but have only one answer each.